Float away with the liquid, swaying effects of this state-of-the-art stereo chorus pedal. 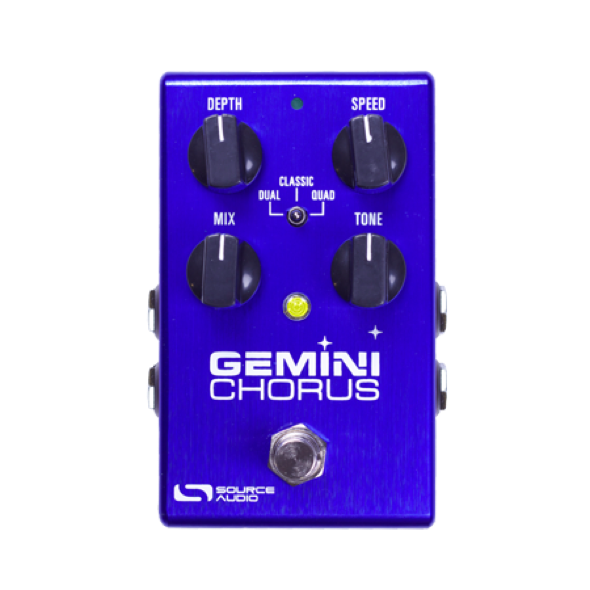 The Gemini Chorus offers three types of deep, hypnotic chorus. Classic mode creates a single voiced effect that conjures subtle and creamy tones from the first wave of 1970s chorus pedals. The thick and rich Dual Chorus provides a smooth, yet animated double voiced effect. The lush and spacious Quad chorus recaptures that ‘80s vibe with its less than subtle rack system sound. Once you’ve found your chorus, dial in the sweet spot with the onboard Mix and Tone controls. Out of the box, the Gemini offers tremendous tonal range, but beneath the hood resides a much deeper level of power and flexibility. Every pedal in the One Series line is compatible with the Neuro Mobile App (a free download for iOS and (coming soon) Android). Link the Gemini to the Neuro App and access Source Audio’s free library of additional phaser, flanger, and chorus algorithms – each can be downloaded directly to your Gemini Chorus. The Neuro App also offers an extended set of adjustable parameters including Feedback, Output Level, embeddable Tremolo, a Parametric EQ, Advanced Signal Routing and more. Plus, every One Series pedal is fully MIDI compatible when coupled with the Neuro Hub (formerly Soundblox Hub), giving you the power to save up to 128 presets. 2Stereo Input and Output jacks – Create deep and wide stereo modulation or engage one of the Gemini’s many Signal Routing options (see Neuro App Features for details). 5Tap Tempo — Change your Chorus modulation rate on-the-fly with Source Audio’s External Tap Tempo switch. Set beat divisions (quarter, eighth, triplet, and 16th) with the Speed knob.